A cross-generational show of works on paper – these are not words to set the pulses racing. But The Sunday Painter has a knack for turning tedious, over-worked curatorial conceits into neat, minimal and totally surprising little triumphs. This disconcertingly empty space works because every piece of art here is its own mini story, a conceptual visual novella. Jonathan Monk has taken a receipt for a meal, scribbled a copy of a Daniel Buren painting onto it and stuck it to the wall – selling it for no more than the price he paid for his dinner. Spread out on the floor, Leo Fitzmaurice has arranged Tesco flyers into an interlocking geometric pattern – it’s the supermarket version of classic sculptural minimalism. On the wall he’s folded cigarette packets into brilliantly clever mini football shirts next to a Wolfgang Tillmans paper drop photo. 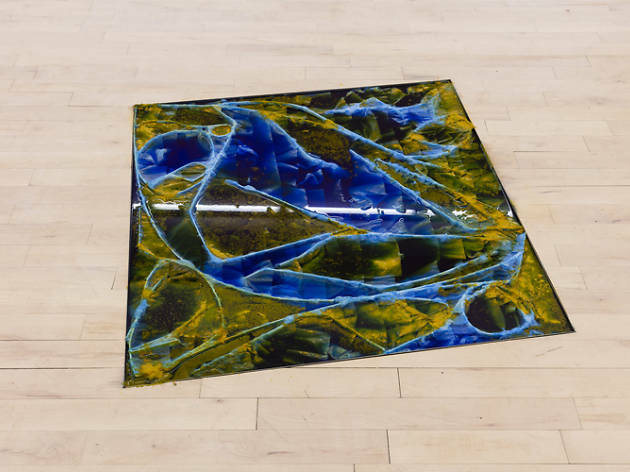 In the centre of the space, Samara Scott’s pool of toilet cleaner, bog roll and turmeric (pictured) feels bubblingly alive, a seething pit of effluence and aesthetics. There’s even a tiny little Eva Hesse ink drawing on the wall, watching benevolently as all these young ideas unfold beneath her. Paper flaps about in this show’s conceptual breeze, slapping you gently in the face, showing how artists can take something simple and constantly reinvent it, constantly make you think new thoughts. You might only ever be able to fold a piece paper eight times, but you can always find new ways to use it.